How to setup .co.cc domain dns for yolasites? I am unable to set up .co.cc domain dns for my yolasite. You need to configure your DNS settings to point to Yola's IP address: 208.75.208.172. Normally you would do this using the DNS control panel in your domain registrar account. Once you have done this you will be able to publish your site. Once you have done this you will be able to publish your site in Yola to your new domain. Let us know if you need help further. tHANx for ur reply dre. But i must say that i'm all dummy about all this. I am getting the following options with my .co.cc domain. 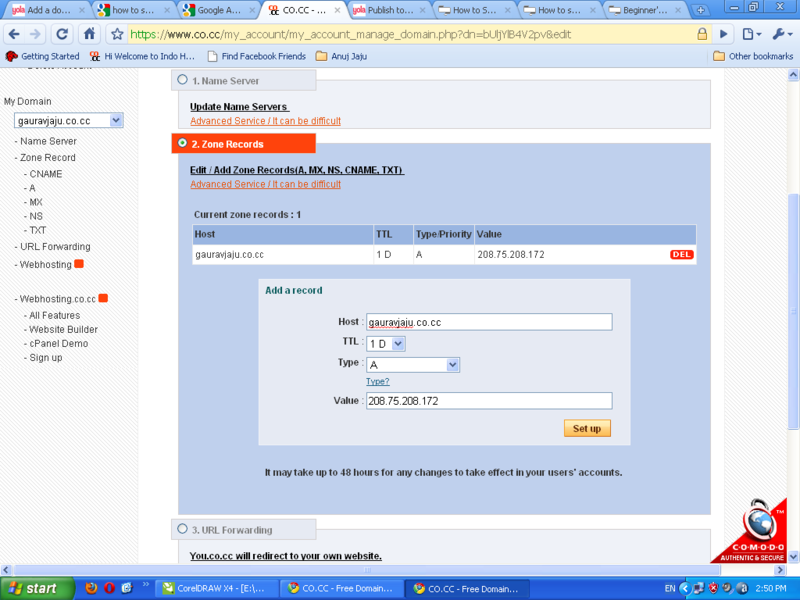 Now i tried to setup name server but dnt knw whether i did that right or not so here is the image. If it is right thn please tell me how i can connect this domain with yola nw?